V12 Mohawk Vintage Leather Chukka Boot. Built with a brassed lacing system, contrasting heavy duty stitching and the traditional sewn-on sole. The difference is in the comfort, from the deep padded collar and soft suede tongue to the footbed with dual shock absorbing pods. These boots will become old friends. 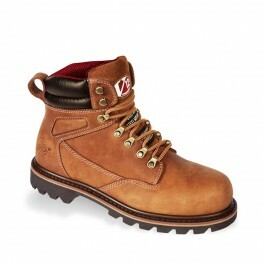 Full grain "Vintage" Cow hide upper - durable, water resistant and breathable. Heavy duty triple stitching and brassed lace system. Ankle support with impact protection. Airtex, highly breathable lining - cool in the summer, warm in the winter. Full length, removable footbed made from 100% memory foam. Wide fitting, corrosion resistant, steel toecap - resistant to 200 joules. Heat resistant to approximately 300°c. Conforms to EN ISO 20345:2004 SBP SRA HRO.